With just 33 villas discretely tucked away in the vegetation lining the stunning beaches and not a concrete sea wall in sight, this is how a Maldives island should look - natural, beautiful and unspoilt! Excellent snorkelling on the house reef (which unusually is also good and deep enough for scuba diving) as well as a host of watersports available including jet-skis, parasailing and waterskiing! The Sunset Bar is a gorgeous and unusual double storied wooden bar and deck area - the perfect place to enjoy a cocktail with your feet in the sand as the sun slowly sinks to the horizon! 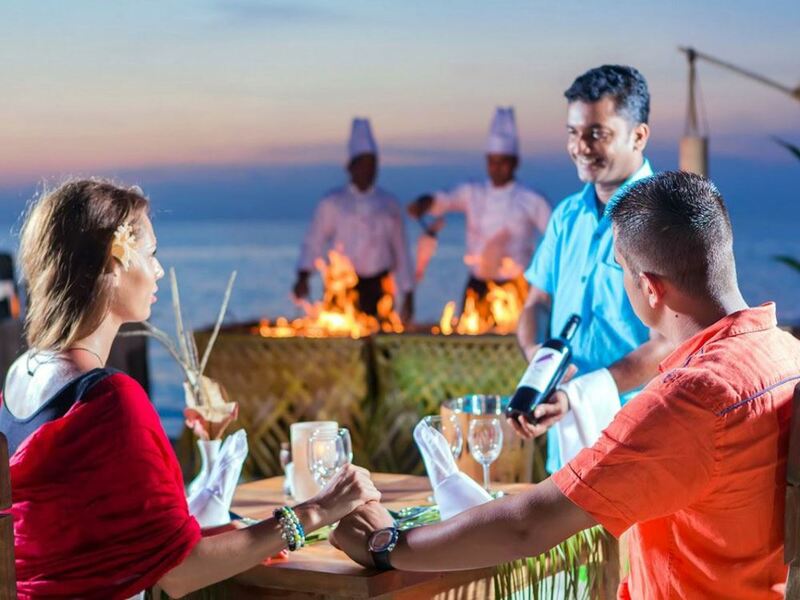 it all really adds up to a great concept - the modern day recreation of an old-style Maldives resort - which has been wonderfully executed: aaaVeee really is like the old Maldives, only even better!!! When tourism started in the Maldives back in the early 1970’s, the resorts that were developed were typically simple, smaller sized resorts, consisting of a limited number of beach villas tucked away in the palm trees lining the gorgeous white sand beaches, with perhaps a sand floored restaurant and basic Spa offering a limited range of massages – the emphasis here was squarely on the natural beauty of the islands, both above and below the water. Over the last decade or so though, the Maldives has (unfortunately in the views of many, including ourselves) chucked out this approach and increasingly embraced an ever more exclusive and luxurious resort model - hugely luxurious 6 Star palaces (complete with masses of water villas, sophisticated restaurants that wouldn’t be out of place in the streets of the world’s capital cities not to mention state of the art Spa and other leisure facilities) seem to be opening on every second island these days, many times after the closure of the simpler old style resort previously found there. And hand in hand with this accelerating move towards ever larger resorts boasting over-the-top luxury has gone ever increasing over-the-top pricing, making the newer resorts completely unaffordable to the average traveller. So it was with absolute delight then that we greeted the opening of the new aaaVeee Nature’s Paradise Island resort located on Dhoores island in Dhaalu Atoll – this is a deliberate attempt to reverse the recent trend and instead recreate an old style Maldives resort: smaller and simpler with more emphasis being placed on preserving the natural beauty of the island, both above and below the water. In fact the concept of recreating the original Maldives resort concept led to the resort’s name, with “aavee” in the Maldivian language (Dhivehi) meaning “revival”. The island is a small 8 hectare jewel located on the northern part of Dhaalu atoll, just 30 minutes seaplane ride from Malé. 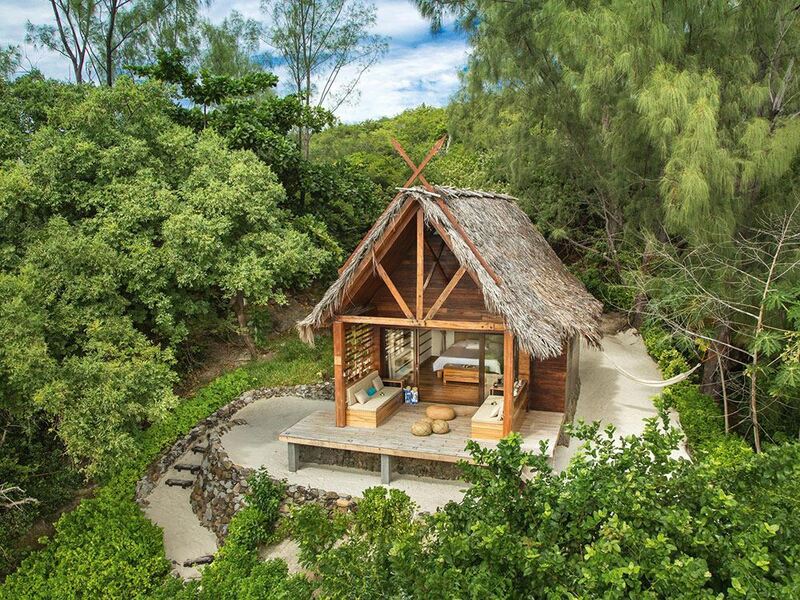 There are just 33 Maldivian style eco-bungalows tucked away discretely in the vegetation lining the beaches and built with a combination of local materials that blend with the natural environment. The vast majority of the island has been kept untouched to provide the guest with an up-close-and-personal experience of the ‘typical’ island paradise that is the Maldives. The thick forest of the island has been virtually untouched, through which guests can wander and experience what a real “nature’s paradise” in Maldives is like. There are 3 room types on offer: the most reasonably priced option are the 16 Kotari or Deck Villa rooms; then there are 13 Goathi or Beach Villas and finally 4 Kotari Kolhu Suites which have 2 bedrooms and so are perfect for families. 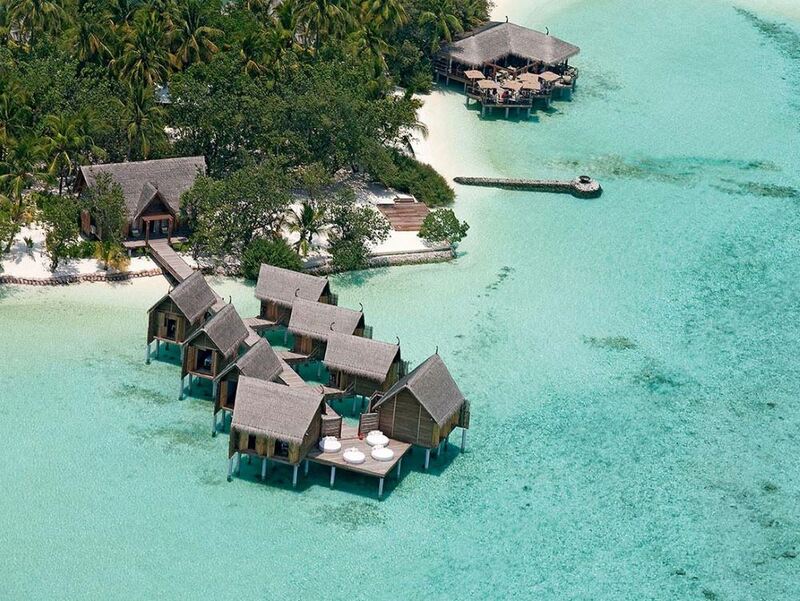 All of them are simple by modern Maldivian standards with the majority of the woodwork constructed the island’s coconut trees that removed to make way for the construction. The light fittings, sofas and chairs inside the room are all handmade using local timber. Similarly, the use of locally made rope and other parts from the coconut trees make this a truly Maldivian room. Even the curtains have been selected with the bright colours and materials that were used in local houses more than 30 years ago. It’s not all completely retro though with all room types boasting those modern comforts of air-conditioning and television. Around the island the same type of approach prevails – keep things as natural and unspoilt as possible (no swimming pool for example, which is hardly a hardship given the incredible ocean you’re surrounded by) but providing a modern and very stylish twist on the old traditional Maldives resort recipe. The 2 restaurants and main bar keep the old “feet in the sand” sandy floors approach of old but combine this with much more stylish architecture than would have been found back in the 80’s. We especially love the Sunset Bar – a unique and very attractive wooden deck with bar below and seating area (including sandy floor) which is the perfect spot to relax with a cocktail as the sun sinks towards the horizon! Another great feature are the innovative Beach Decks – attractive wooden platforms covered in sand above a small rocky part of the island shore where you can relax on a comfy lounger whilst admiring the stunning views of the sea! 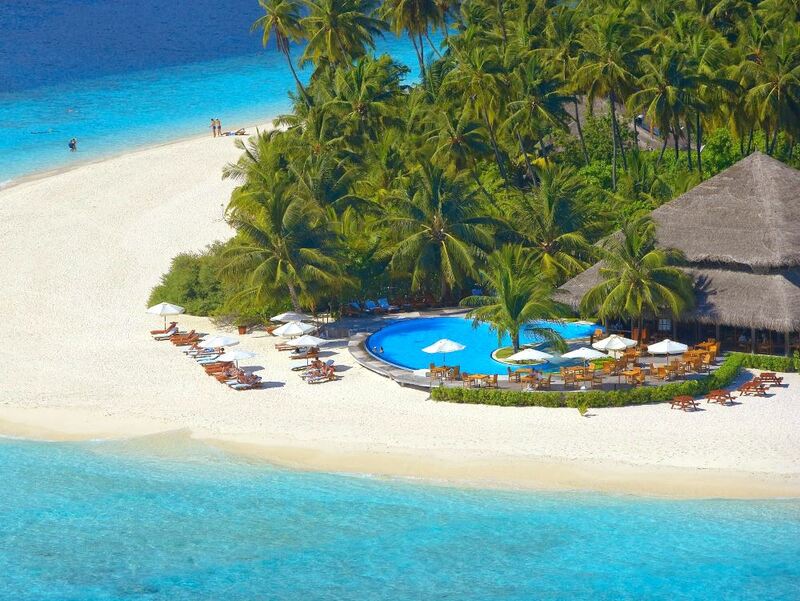 Talking of which, the ocean around aaaVeee plays host to a full range of activities. The house reef is stunning for both snorkeling and (unusually) even scuba diving. The watersports centre also offers a wide range of activities that those old 1980’s Maldives resorts could have only dreamt of, including jet ski’s, para sailing, canoeing, banana boat ride, water skiing, and power snorkeling! If that’s all too hectic then there’s fantastic swimming off the gorgeous sandy beaches of course. There’s also a lovely Spa where you can be thoroughly pampered and spoilt, which includes 2 gorgeous treatment rooms built over the water! In fact it all really adds up to a great concept - the modern day recreation of an old-style Maldives resort - which has been wonderfully executed: aaaVeee really is like the old Maldives, only even better!! !